MailBuddy is NO "Return Bot"! A simple add-on to help you with your mailing needs! A must have helper for return mails. 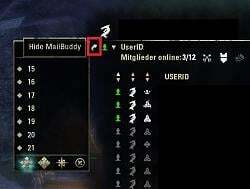 New Update - Totaly rewritten addon for ESO version 1.6.5 with clean UI, more comfort, power & speed! Alternative layout will remove these edit boxes to keep the UI clean. 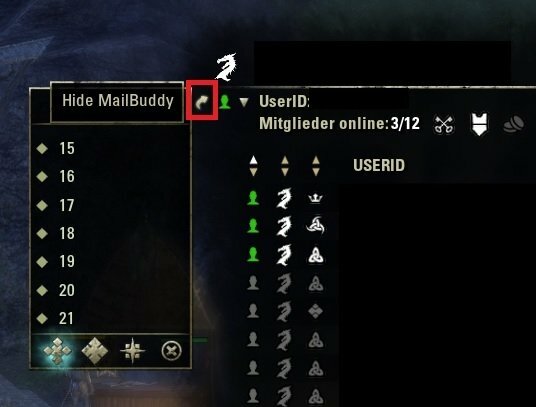 You can show/hide them by right clicking the standard ESO mail recipient / subject edit box. MailBuddy is no Return Bot itsself! The RETURN (or RTS, or BOUNCE) subject is only used for OTHER addons, like Wykkyd's Mail Return Bot or MailReturn. You need to additionally install one of these addons at the recipient's account. If he/she will get mails with the subject RETURN, and opens his/her mailbox, the Mail return Bot will return the mails automatically. MailBuddy is just the ther part at the sender side to speed up the mails, remind the last recipient and subject, etc. so you are able to quickly send several return mails right after each other. In addition with the addon "DoItAll with FCO ItemSaver support" you could just open your mail sent panel, MailBuddy remembered your last recipient and subject, you press a keybind to "Attach all" items currently shown in your inventory (comes from DoItAll) and the mail will be send automatically (DoItAll settings) if it is full (or not, depends on your settings). You just need to confirm that the attachments will be sent. Afterwards MailBuddy puts the recipient and subject in again for you (and if you have configured it in DoItAll) the next attachments will be automatically added and next mail will be sent automatically if the mail is full (if configured in DoItAll). Now the address book appears next to the Friends List & Guild Rosters when you open them, pretty neat! Set a keybinding via Esc>Controls>Keybindings>MailBuddy>Copy Name ! on the address book! Working on one for the group list as well! and also to everyone who has downloaded MailBuddy so far! Added: If current number of mails is lower then (MAX_MAIL_COUNT / 2) the current mail count will be shown white. If it's higher then (MAX_MAIL_COUNT / 2) but lower than MAX_MAIL_COUNT it will be shown orange. 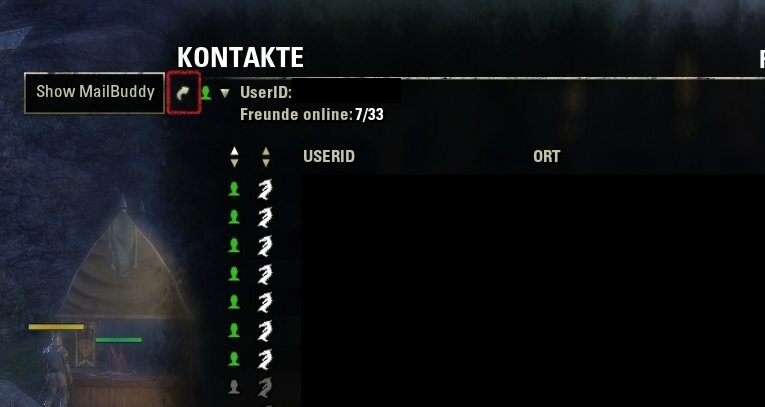 If it's equal or higher than MAX_MAIL_COUNT it will be shown red. -Added: Option to automatically open the recipients list/subjects list as the fields get auto-focused by the addon. Enable the alternative layout, enable auto focus for recipient and subject, enable auto open for recipients and subjects list and enable auto close of recipients and subjects lists: This will speed up your mail creation a lot! 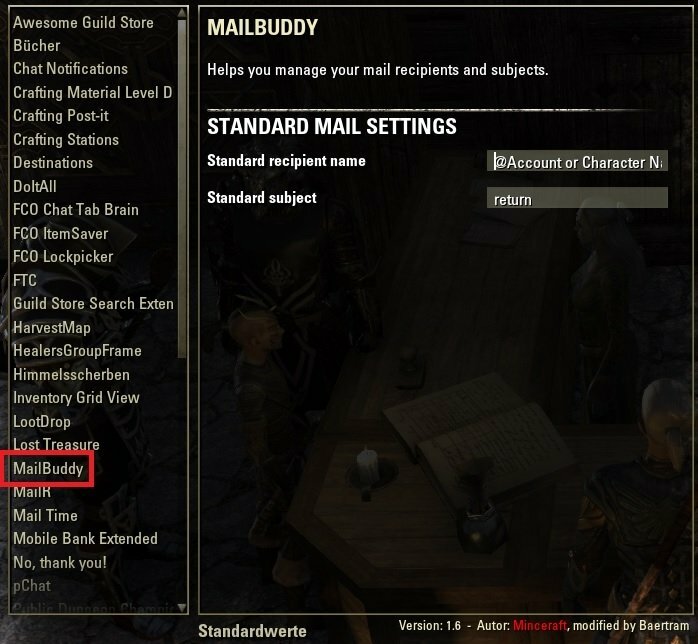 -Fixed the "new mail" panel: If you had enabled the setting to remember last mail recipient the last recipient was also used, if you started to send a mail by using the mouse context menu at the chat/guild roster/friends. If the recipient name is preGiven by the game now this one will be kept. But the addon still will use your last subject and text if you have enabled this in the settings! Update 2.2 -- This update will need to use new settings so your currently saved lists will be gone! -Added mutiple language support (chooseable in the settings). English an german texts are up2date. French and spanish tarnslations need help please! If you are able and willing to help contact Baertram by PM please. Thanks a lot! 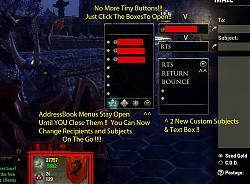 Update 2.1 -- Totaly rewritten addon for ESO version 1.6.5 with clean UI, more comfort, power & speed!! 2 different layouts can be used now. Standard layout will add two edit fields left to the mail's recipient and subject name. Update 1.4 -- Added new feature with the AddressBook to make loading name easier! AddressBook now appears next to Guild Roster and Friends List windows. Added a Keybind feature for copying names to the selected page of the AddressBook from either list when the names are moused over. Update 1.3 -- Minor Patch with a few errors and bug fixes ;) !! Update 1.2 -- Added the AddressBook feature ( requested by dopiate! Thanks!) for further functionality! Update 1.1 -- Re-wrote code for better readability ( Thanks, Garkin!!) Still works like a charm!!! Some of the subjects are hard coded (return, rts, bounce). The others can be deleted by clicking on the small icon to the left of them. Visit Assassin AKA Talon's homepage! Is there by chance a reaD ME to let me know what the various buttons do? Love the addon so far thx! Yes as I find the time I'll add tooltips. But currently I've just time to add a screenshot to the addon screenshots. Please check the addon description page and open the first screenshot. At the friends list and guild roster it works pretty the same except that there is no "To" field like within the mail create panel! 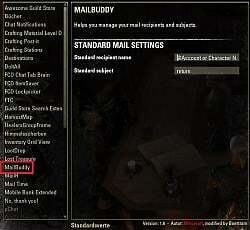 YOu just click the small arrow to show the Mailbuddy "recipients" box and are able to add a name from the list to the Mailbuddy "recipients" by using the keybind which you need to set in the controls settings of the game. Last edited by Baertram : 07/17/18 at 01:45 AM. Check the addon settings and enable the setting to remember the message recipient, subject and/or text. The text should be remembered then and put back in after each send mail. No there isn't. Sorry to say, I won't implement mass mail sending with this addon. You'd need to paste the names manually in, press send, then exchange the name. The addon wouldn't be able if you get kicked due to mass sending messages and I won't be able to invest the time to implement and test this. As an enterprising seller I have taken note of all the @names that buy certain items I sell. Similar to a Guild Mail shot is there some way I can manipulate the addon to work with a longish mailing list? maybe its just as simple as pasting multiple names in the "to" box on the mail header although I have tried this and it did not work. Probably if this is allowed then I just need to know the format/correct delimiter between the names. So far I have been doing this one mail at a time by hand, somewhat tedious. As a new user of MailBuddy I was not exactly sure of its capabilities and your answer is more or less what I was thinking too. I have been trying to send the same message to multiple players and the title is saved but the message text needs be entered each time. Maybe I have messed up somewhere. I wil try again after todays maint. Last edited by Baertram : 12/08/17 at 03:31 PM. The game will clear all fields of the mail, yes. I'll check if I can react on this to refill the name, subject and text again. Ah, wouldn't have expected this from your first post Thanks. Will check if this is a standard behaviour of the game. 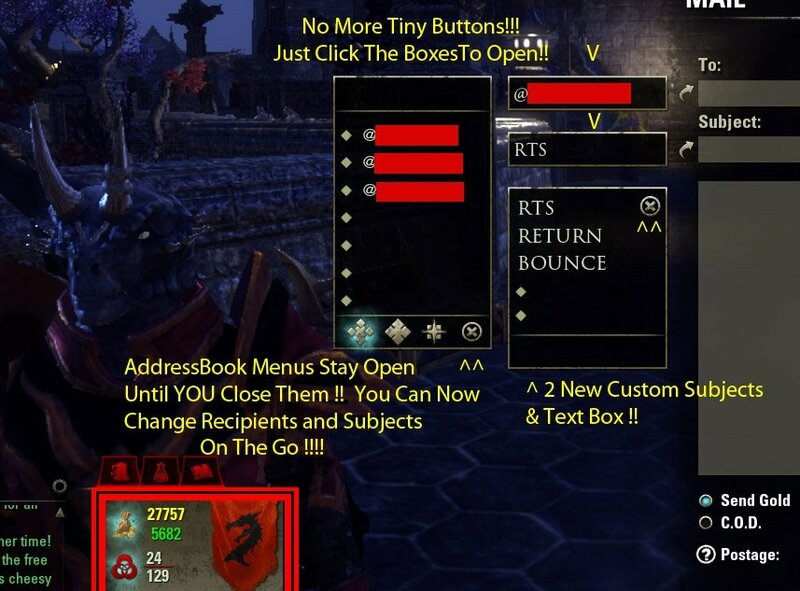 After testing this I recognized that there is NO X button in the base ESO ui for the mail attachments? And Mailbuddy isn't adding any X to the mail panel! So what X to remove the mail attachments are you talking about please? It must be some other addon. Please disable all other addons except mailbuddy and just test if everything works as expected and if there is the X button that you meant. -> If so: Please provide a screenshot of this X button here! I'm not quite sure which X you are refering to? Last edited by Baertram : 10/29/17 at 11:31 AM.